Interview with Judith Barry at Whitechapel Gallery, London. Aired on Levant TV, Arabesque. Not reconciled, is a series by Judith Barry that explores the construction of subjectivity, history and identity in countries and cultures around the world. 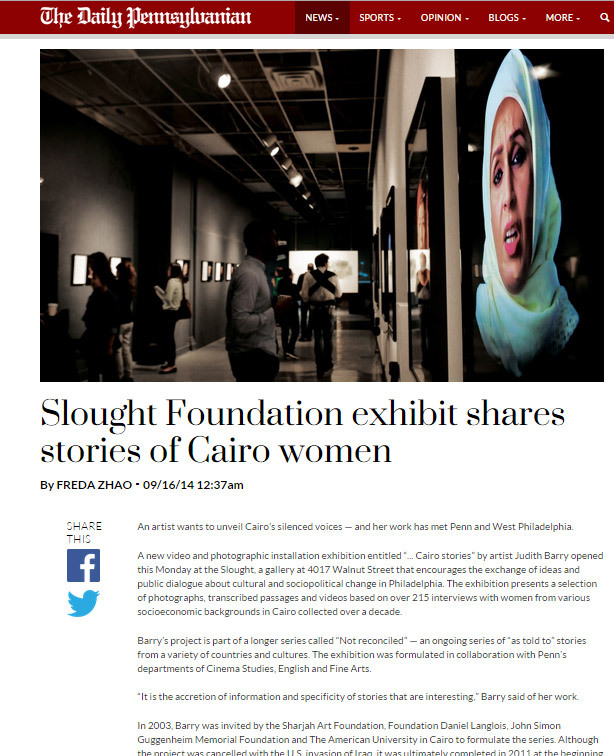 In her latest rendition of that series…Cairo Stories,which was on view at Rosamund Felsen Gallery in April, Barry presents interviews with Cairene women from varying backgrounds. 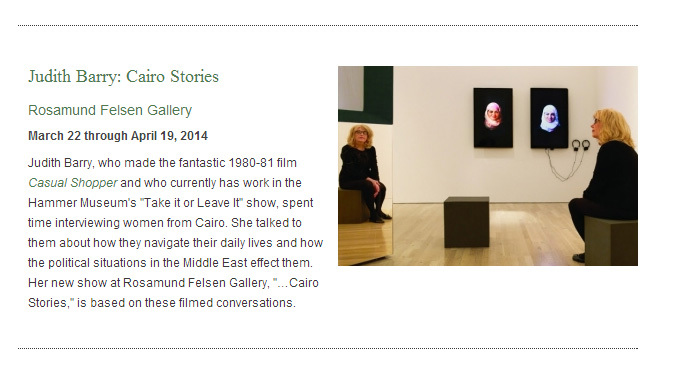 The stories the women tell focus on the negotiations they must make due to Cairo’s social, cultural and economic life. Conducted between 2003 and 2011, the interviews demonstrate the complex systems, allegiances and political stratas that Cairene women must navigate on a daily basis. Sometimes their stories feel un-relatable, as when Ayousha describes how “my husband died, and they wanted his brother to take me as another wife.” Other times their observations hit closer to home, as when Layla remarks, “We all have our shares in life, God willing…You got dealt your. I got mine. 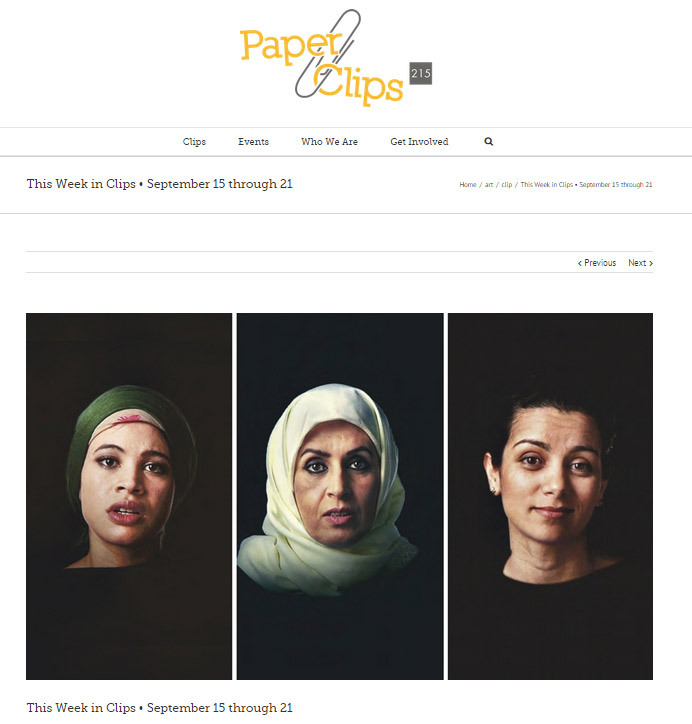 My sisters theirs…Everyone gets their share…But you got to make it what you can.” Either way, the more stories a viewer hears the more intimate a connection she feels toward these women, despite their diverse backgrounds. 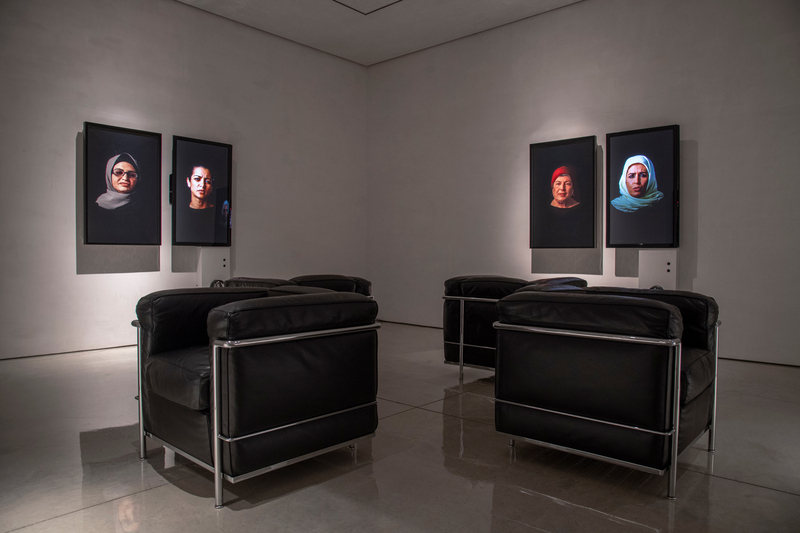 Presented in both Arabic and English, by actors rather than the actual interviewees, there is something unsettling and poignant about watching the interviews, particularly in doing so within a pristine gallery setting. In listening to these women’s experiences notions of representation, allegiance, class, family history and subjectivity are brought to the fore. One cannot help but compare these women’s journeys to one’s own. The presence of the actors emphasizes the idea that a story, if it’s a good one, no matter how it’s told, can be highly emotionally impactful. 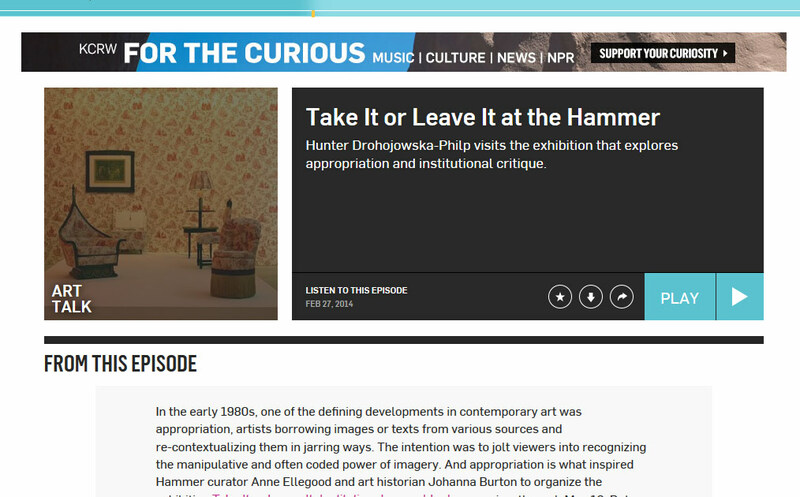 Though you missed the show at Bergamont Station three of Barry’s works are currently on view as part of the Hammer Museum’s exhibition Take It Or Leave It: Institution, Image, Ideology through May 18, 2014. Or you can read ArtBlitz LA’s interview at ArtBlitz Los Angeles. “…To trace the history of appropriation and institutional critique, the curators have commendably chosen work by some of the usual suspects— Mike Kelley, Sherrie Levine, Allan McCollum, David Wojnarowicz —as well as less-celebrated figures. Of the 37 artists, 17 are women. Several bold-face names— Jeff Koons, Richard Prince, David Salle —have been excluded to make room for work that isn’t as widely circulated: by Judith Barry, Dara Birnbaum, Mark Dion, Renée Green, Mary Kelly, Sylvia Kolbowski, Zoe Leonard, Cady Noland, Stephen Prina and Fred Wilson. To read the complete article, please visit The Wall Street Journal online. In the early 1980s, one of the defining developments in contemporary art was appropriation, artists borrowing images or texts from various sources and re-contextualizing them in jarring ways. The intention was to jolt viewers into recognizing the manipulative and often coded power of imagery. 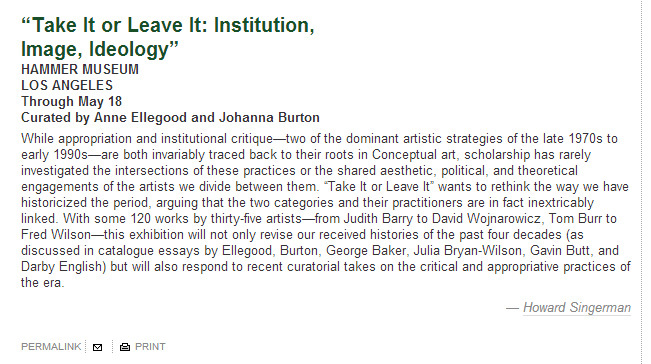 And appropriation is what inspired Hammer curator Anne Ellegood and art historian Johanna Burton to organize the exhibition Take It or Leave It: Institution, Image, Ideologyon view through May 18. But they added a twist by focusing on artists who used appropriation strategies to critique aspects of the larger culture and its institutions. 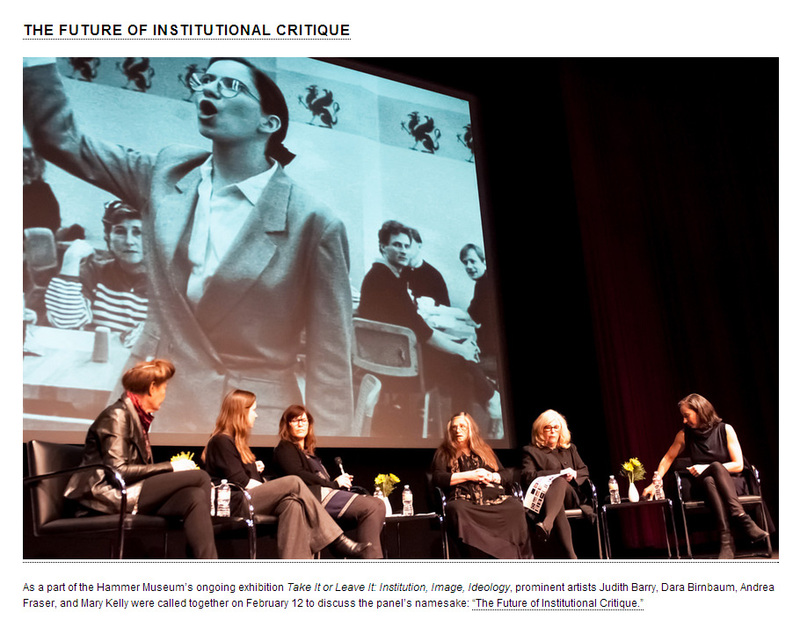 In addition, they chose to highlight Feminist artists who were among the first to engage in what has come to be known as institutional critique: questioning the decisions that determine who is heralded and why in museums and galleries and other institutions. The exhibition “Take It or Leave It: Institution, Image, Ideology” at the Hammer Museum is an extensive historical exhibition that examines the fundamental roots of institutional critique and appropriation over a forty-year period beginning with pivotal works by feminist artists of the 1960s. Curated by Anne Ellegood and New Museum curator Johanna Burton, the framework examines the development and evolution of appropriation—the borrowing of images and styles from mass media or fine art sources—and institutional critique—the interrogation of art, society, and its structures from within. As a whole, the framework resists what Barbara Kruger has called “decadism,” presenting works from the past as well as the recent present in order to explore history as a mercurial, fluid subject rather than an overarching period. 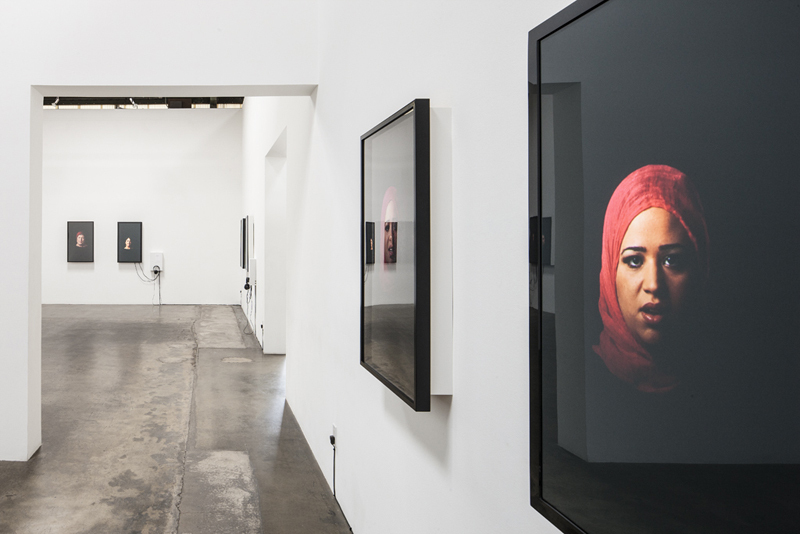 With each gallery separated by distinct terms—Representation, Politics, Media, America, Language, Interaction, Public Record, and Archive—the spaces overflow with objects and installations. The exhibition display pushes against conventions of a neatly organized exhibition suggesting that institutions, images, and ideology can all be rather messy subjects. And since the works are not chronological, the exhibition forms a constellation of ideas that create generative slippages between memory, history, the past, and the present, building a potential for these subjects to evolve in the future. 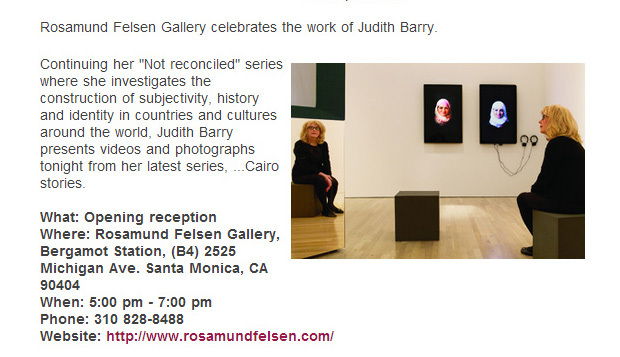 Rosamund Felsen celebrates the work of Judith Barry.